Our latest addition to Roguefarm is a small mushroom-growing setup. It's a task that calls for lots of patience. While some varieties can be grown in six months or so, others take as long as three YEARS before they can be harvested. That's if the whole thing works at all, that is. It turns out that one can buy mushroom spores (including psilocybin "Magic Mushrooms" if that's what you want) on line from various vendors. The Blue Oyster, Pleurotis Ostreatus var. Columbinsus, is a gilled mushroom and is widely eaten. We picked it because it is supposedly one of the easier varieties to grown. 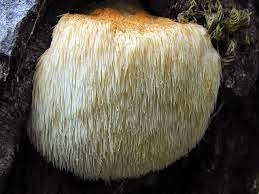 is a "tooth" mushroom, meaning that it grows its spines from one central body instead of from branches. We've never tasted one, but they are often compared to seafood and are widely used in vegetarian cooking as a substitute for various animal proteins. The Maitake, Grifola Frondosa, grows from an underground portion, so it can fruit year after year once established. 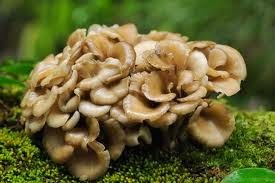 Also called the "Hen of the Woods," it's used widely in Japanese cuisine. We chose it because it's one we know and that we can harvest repeatedly. Since we have lots of logs around, we chose to use a technique called "plug spawning" that grows mushrooms on logs. Our spores came from Fungi Perfecti in Olympia, Washington. The two logs on top are Maitake, the two beneath Blue Oyster. They're oak logs, which mushrooms like, and are supported by the barkless madrone, which they don't. Will it all work? Stay tuned. It's a long process, and there's certainly no guarantee of success. We'll let you know in a year or so.